Education Loan Task Force (ELTF) is one of the social initiatives of eMagazine PreSense. It is a voluntary initiative since 2010 creating awareness about education loan and also taking up issues in Parliament through supporting MPs. On 17th February 2017, PreSense and ELTF organised an interactive session at Chennai with Shri Arjun Ram Meghwal, Hon'ble Union Minister of State (Finance & Corporate Affairs) to discuss the education loan issues. Senior bankers from 40 banks and various social workers participated and interacted on the various issues. During that time, Hon'ble Minister announced that he would arrange a meeting of Senior officials of Finance Ministry at Delhi so that ELTf can directly present the issues to find out the solutions. Accordingly, Shri Arjun Ram Meghwal organised a meeting at North Block on 16th March 2017. Shri R N Dubey, (Economic Advisor to Department of Financial Services) and two other senior officials were present. Shri Gautham represented Indian Banks Association (IBA). Shri Meghwal presided over the meeting. On behalf of ELTF, I made a presentation to the Minister and other Senior officials on the various problems faced by students. Hon'ble Minister and other officials listened patiently. Minister also advised the officials to examine all the points and to submit a feedback to him. While concluding the meeting, Hon'ble Minister siad, "You will find some changes shortly". ELTF thanks Shri Arjun Ram Meghwal for the keen initiative taken by him to understand the problems and to find solutions. A brief report on the proceedings is attached. Kindly go through the report. You may kindly send feedback to me. The report can be downloaded from this link. A brief report on the meeting held at Ministry of Finance, New Delhi in the Chamber of Shri Arjun Ram Meghwal, Hon’ble Union Minister of State (Finance & CA) on Education Loan. K. Srinivasan, (Chairman, Prime Point Foundation and Convenor of Education Loan Task Force – ELTF) made a presentation to the Hon’ble Minister and other Senior officials on the problems faced by students in respect of implementation of Education Loan Scheme. The bank officials are not having sufficient knowledge about the Education Loan Scheme. Though Vidyalakshmi Portal is made compulsory, awareness is lacking on the part of students and bank officials. IBA and the banks should create adequate awareness about the Vidyalakshmi Portal. A mobile app can also be created for Vidyalakshmi Portal, to enable students to submit the applications through Mobile. Srinivasan informed that Banks were not deciding the loan applications within 15 to 30 days as per IBA norms. Even the rejections are not done within the time, causing lot of inconvenience to the students. Srinivasan brought to the notice of the Hon’ble Minister that interest subsidy was not paid in full (100%) as promised by the Government. Only a small portion was being paid. Also, he pointed out that the banks have not claimed interest subsidy for the eligible students, thus depriving them of the subsidy. Srinivasan informed the Hon’ble Minister that there was a delay between the bank’s receiving the amount from the Government and credit to the loan account. He said that the students had to pay interest unnecessarily. Srinivasan suggested that instead of interest subsidy, the Government can consider ‘interest free education loans’ and fix some suitable norms. Srinivasan pointed out that many banks artificially create NPAs by including the interest subsidy portion not received from the Government and also by pressurizing the students to repay the loan within short time. He suggested that the Government should fix separate norms (for classification of NPA, rescheduling the EMI, etc.) for Education Loans and not to be treated as commercial loans. Education Loans are for the future. Presently, the students come out of the Colleges are burdened with huge debt and they are demotivated. Banks also do not give proper counseling to the students. Srinivasan also brought to the notice of the Hon’ble Minister and the officials as to how State Bank of India was transferring the loan accounts to private agencies ARCs for recovery by offering huge concessions. In turn, the ARCs also harass the students. Srinivasan brought to the notice some of the students had committed suicide due to harassment of ARCs. He submitted two appeals to Hon’ble Minister. (1) Education loans should be kept away from the purview of ARCs and the banks should handle the recovery through legal methods and (2) possible nexus between the State Bank officials and the ARCs should be examined in vigilance angle. He further said that instead of offering huge concessions to ARCs in the name of cleaning up of ‘balance sheets’, State Bank of India could follow IBA guidelines by offering permitted concessions to students. That was why he said that ELTF demanded a vigilance probe on SBI to examine the possible nexus between the bank officials and the ARCs. Srinivasan suggested that a Monitoring Committee may be set up at National and State level to review the Education loan disbursements. Social workers may also be involved in such committees, besides officials. 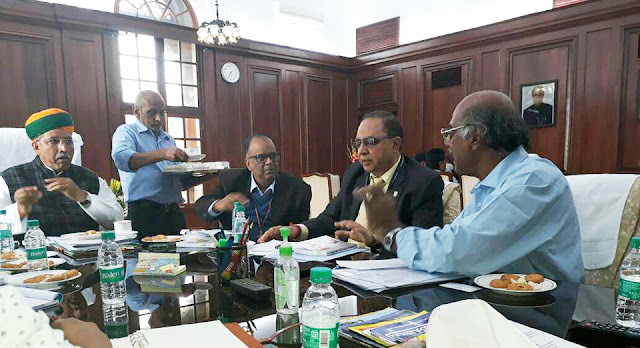 Srinivasan suggested that Nodal officer / Grievances Cell may be set up at Zonal offices and the Head Offices of Banks immediately to redress the grievances of education loan applicants / borrowers. Srinivasan quoted that when Dr K C Chakrabarthy was the Dy. Governor of RBI, he nominated in 2010 a CGM of RBI as Nodal Officer at RBI for Education Loan purposes and it was functioning effectively. This was done on the suggestions of ELTF then. Due to passage of time and due to transfers, this is not functioning. He suggested that a Nodal Officer may be nominated both at RBI and at the Ministry exclusively for Education Loan purposes. (Hon’ble Minister agreed with the suggestion of Nodal Officers at Zonal Offices and Head Offices of the Bank immediately. He also recalled that he himself made announcement at Chennai during the Interactive Session on 17th February 2017. He advised the Ministry officials to issue directions to all banks immediately). Srinivasan also requested to reduce the rate of interest for education loan. He suggested a new institution like NABARD, SIDBI may be set up to refinance all Education Loans given by the Banks. Srinivasan concluded his presentation by appealing to Hon’ble Minister and other Senior Officials to issue directions to all the banks to scrupulously follow the IBA guidelines. He said that the students and parents suffer due to the branches not following the IBA guidelines and due to lack of awareness among the bank officials. He even pointed out that in many banks even senior officials were not aware of the IBA guidelines on Education Loan.